Spring has finally sprung! I’m looking forward to increasingly warmer days and the slow inching closer to summer…After a recent weekend trip to the warm and sunny Gold Coast and reminiscing on my summer Italy holiday this year has made me long for the warmer weather and all its perks. Chilling at the beach! Thongs, swim gear, ice cream and long walks in the sunshine. It can’t come fast enough! 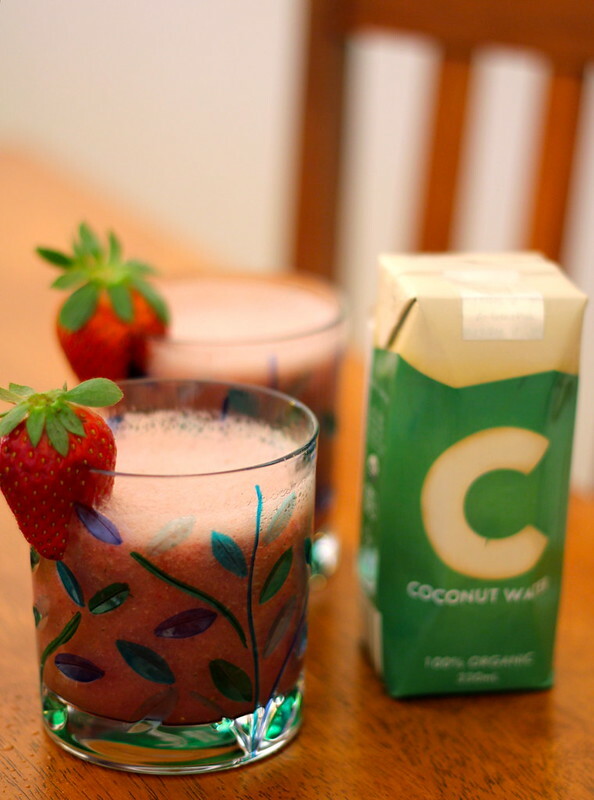 When the Sweaty Betty PR team sent me a package of C Coconut Water, I felt inspired to create this refreshingly cool frappe to bring a little bit more summery goodness into my kitchen. While I’d never tried Coconut Water before, I had heard a lot of hype about it in the health community – it’s naturally low in sugar, calories, carbs and sodium, contains zero fat and is high in potassium and minerals. Due to its super properties, it has been touted in the health community as a sports/energy drink. Another interesting fact I recently learned about coconut water is that in some cases, it can be utilised as an emergency supply of saline or blood plasma – as it is sterile while still in the coconut. Fascinating stuff! After learning all these interesting Coconut Water facts, I was quite excited to give it a try! After tasting it for the first time (it has quite a mild flavour, almost with a slight nuttiness to it), I thought it would go nicely with some lychees, strawberries and a few mint leaves to liven it up. The end result was a refreshing pick me up with the fruity flavours all melding together quite nicely. Tested it out on Mike and he loved it! 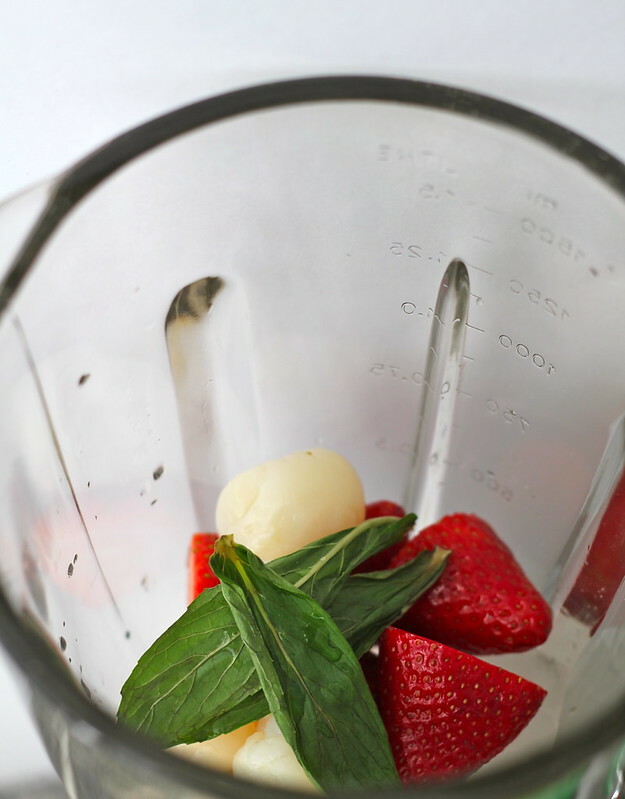 Another reason why I like this one is that it’s so easy to whip up – canned lychees, a couple of berries, some coconut water and a few leftover mint leaves from the fridge all blended together and you’re done! I do hope you enjoy this – its certainly perfect for the incoming warmer days! Note: While it is quite sweet from the fruit and the lychee syrup, it is not a super sweet frappe – so if you wanted to sweeten it, you could add a little more lychee syrup, or even a simple sugar syrup – (similar to ones used in cocktails) to give it a sweeter kick. 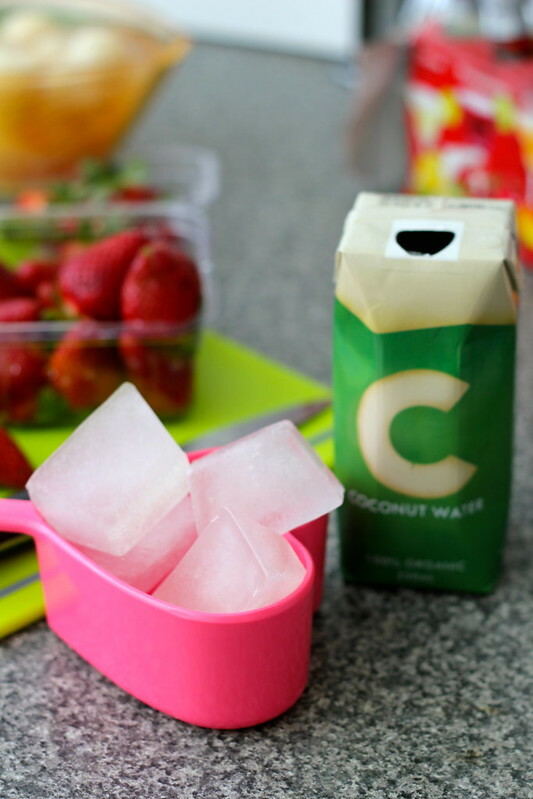 Fill one ice cube tray with 1 carton of the C Coconut Water, place in the freezer and freeze overnight, or until completely solid ice cubes form. To find your nearest C Coconut Water stockist, click on the link here, click ‘stockists’ and enter your postcode for a handy dandy list of your closest C Coconut Water retailers! 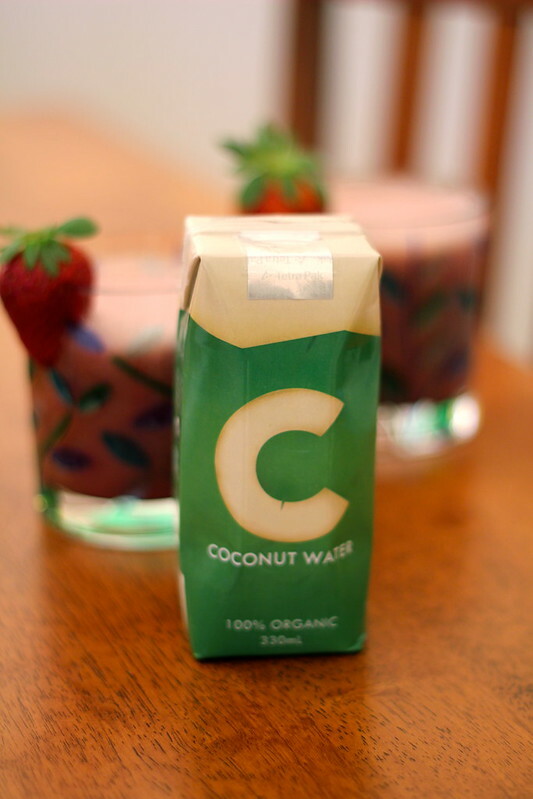 CookingCrusade.com was commissioned by Sweaty Betty PR to develop this Coconut Water recipe. Such a lovely combo! Anything with lychee gets my vote, but combined with the coconut water it’s so fresh instead of creamy. Delicious. Oh man, the sound of this sounds absolutely amazing. I WANT I WANT I WANTTT!! Not a huge fan of lychee but I’m sold with the strawberry & coconut water. The combo of coconut & lychee is awesome. But with strawberry sounds perfectly awesomely refreshing! I just love fruity flavours 😀 Thanks Raff! Fresh coconut water from a good young coconut is still the best for me (though hard to come by here), but this frappe looks super refreshing! Lovely flavours. Thank you! Yeah – can’t beat fresh coconut water! Gorgeous photos Christine! Very crisp and clear! Thanks so much Lorraine – coming from you, that’s a big compliment! Mmm yummo! Must give that one a go… might give it a twist of Limey goodness too! (If you don’t mind ;)) Thanks for sharing! Mmm this looks amazing and I bet it tastes just as delicious!!! I love your measuring cups too!! Thank you! They were a much loved birthday gift hehe. This looks so refreshing and yum! LOVE this, and LOVE C Coconut Water! i don’t really like that coconut water, but maybe your version would be better! I love lychees and strawberries, so this would taste so good. This looks nice and refreshing. Thanks you – and thanks for dropping by! This is perfect for my annual ‘Freak out it’s Spring Diet’. Looks very healthy. I have a nasty habit of buying a half coconut and eating away at it for hours! This sound so refreshing! and healthy too! (: Love lychees! hehe Will be perfect for summer! You’re absolutely right – this is so perfect for summer! 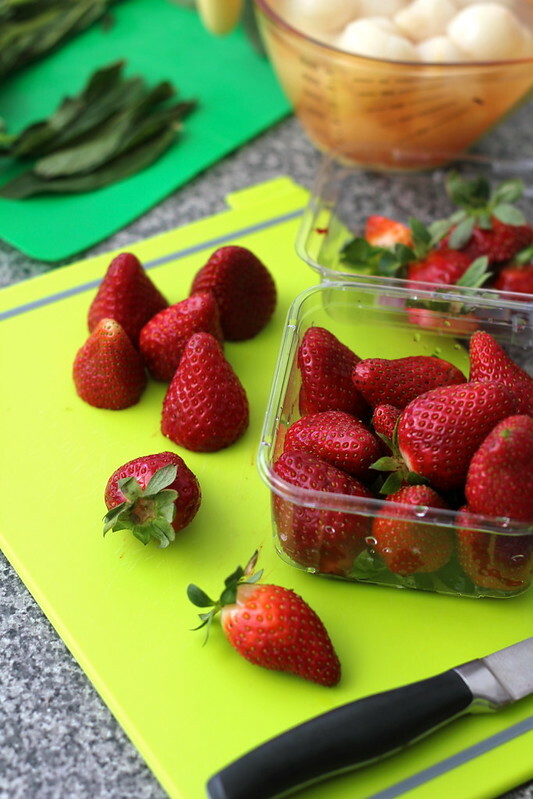 Anything with lychees and strawberries would be heaven!